President Maithripala Sirisena should immediately dissolve the Cabinet and establish a caretaker government with the support of all political parties, Parliamentarian Ven. Athuraliye Rathana Thera yesterday said. He said the country was going through a rough patch and there were agitations taking place, mainly in response to the alleged plot to assassinate President Maithripala Sirisena and former Defence Secretary Gotabaya Rajapaksa. “No one is taking this issue seriously. But I think everyone should. Even though I have my reservations about the President, at a moment like this we should all come together to protect him. If a foreign country or government is trying to assassinate him, it is the responsibility of the authorities to conduct a proper probe,” he told a news conference. Commenting on the reports of Cabinet Ministers having affiliations with RAW and the roles played by former TID DIG Nalaka Silva and the IGP in the alleged assassination plot, the thera said these issues raise many questions. “Why is India trying to kill the President? Once he is no more, who will become the President. According to the Constitution, the Premier will become the President. Does India want to make the Prime Minister the President or want to kill him as well? These are serious issues. It doesn’t matter if its India or China. If any faction wants to harm our sovereignty, everyone should join together to prevent it from happening,” the thera said. The thera said Sri Lanka is on the verge of becoming an unstable country with assassination plots and alienation of national assets in order to satisfy world powerhouses. “Just because we leased out Hambantota Port to China, it doesn’t mean we should give India another asset. We should try to get back the Hambantota Port. I think all ministers and officials of this government should resign and go for an interim caretaker government until the next election is held. The President has the power to call for one according to the Constitution,” he said. How can dissolving the government help solve any problems? DISSOLVE AND TAKE HIM IN SO HE CAN SOLVE THE PROBLEMS. NW HE CANNT REMEBER HW HE PROMTED YAHA PALANAYA. I think its high time for him to protect his priesthood instead of dancing to the tune of politicians. Oya kiwwe. Me rata hadanna beri pandithayao wedi nisa!!! Oh, Sure! Thanks for the suggestion!!?? He has arrived at conclusions based on accepting hearsay as truths. Until properly inquired into, the basics he relies on are unproved. I am fed up with all 255. Why not dissolve parliament? For a start you are on a "Chit". Why not resign. You are one who sold the duty free vehicle permit and we paid the tax. Get out. OUR COUNTRY HAS ALREADY BEEN DISSOLVED IN CHEMICALS LIKE FRAUD, MALPRACTICES AND CORRUPTION. How true. Maybe he will take heed. Well, he is not in the cabinet no!!? Oba wahanse koheda hitiye mey davaswala??? Hari paaluwen hitiye api!!! The day these people keep quiet, the country will prosper! Dissolving the same rotten mixture of these 225 is not a good "solution". (pun intended). Go for an election so we can get a fresh set of 225 - of course hoping the foolish voters will not vote only on party lines and then get more rotten apples. Of what business is it of yours? Clergy should stick to religeous matters and stop trying to be constitutional experts who know when and how governments should be dissolved. what a funny statement it is. Is caretaker government for making another "Keda Heliya". 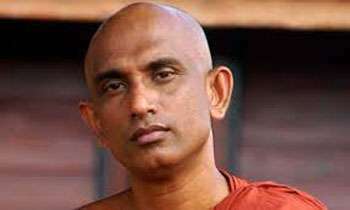 For starters, monks should keep well away from politics and confine themselves to the path of spirituality, for it is their interference in politics that has brought the country down to its present state. dissolve the Cabinet and establish a caretaker government and handover the country to an Undertaker. Problems can't be solved over night and this is not heaven to be problem free.Wow a bright solution. And if that doesn't work, desolve govt again and againBetter to keep quite than utter nonsense. Ven. Thero ! , Please be silent ?, how you have been selected as MP of the Parliament ?, Now you have been enjoyed all privileges of the last regime and present Govt. Now enough to enjoy ? Abolish executive presidency, let parliament elect a president, Dissolve parliament and have fresh elections. Current system has only spread unprecedented corruption in the country which we didn't see before. If parliamentary system is successful in Britain, Australia and Canada why not here? We too had corruption free system until JR brought this good for nothing Executive Presidency. Leave this for the US and Donald Trump not for us. It is because of late SWRD, the safron clad lot got into the political stage. I remember Sir John commented about the tied "Dogs" were unleased by this power crazy AMU SINHALAYA. He should preach the religion not the politics . People making less than 6$ per day while politicians looting the country.